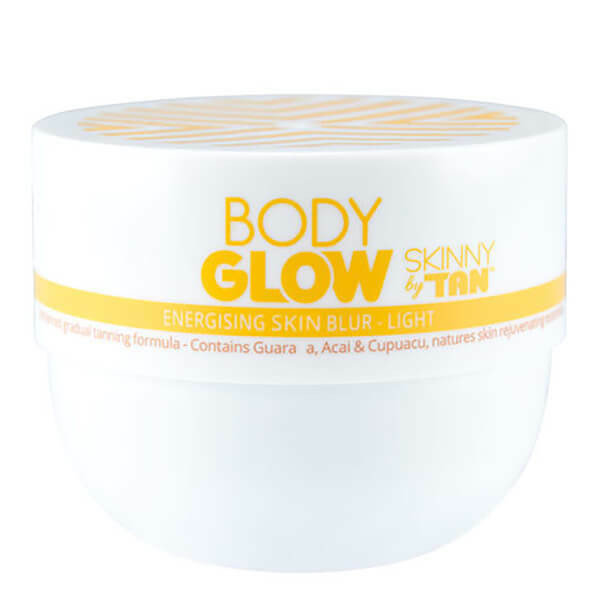 Nourish your skin while encouraging a healthy hint of colour with Body Glow by SKINNY TAN Energising Light Body Blur. Deeply conditioning, the rich body cream utilises powerful ingredients from nature to intensely moisturise and improve the appearance of skin. Melting effortlessly in, the nourishing formula will hydrate on contact while working to develop a light, healthy-looking glow day after day. Free from parabens and sulphates. Apply on clean, dry skin, either all over the body or by targeting certain areas such as upper arm, outer thigh and bottom in conjunction with Body Glow Light or Medium for advanced skin conditioning. Massage in a clockwise circular motion to improve absorption and circulation. 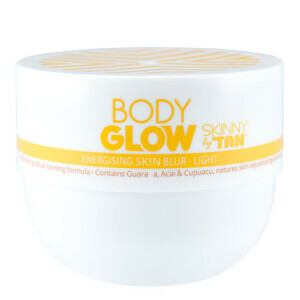 Blend across the body with Body Glow to ensure a seamless summer tint if used as a targeted treatment. Re-apply daily or as often as required to build your desired colour. Maintain your tan by applying every 2-3 days after showering. Wash hands after use with warm soapy water. Aqua (Water), Cetearyl Alcohol, Glycerin, Cocos Nucifera (Coconut) Oil, Isopropyl Myristate, Polyglyceryl-6 Stearate, Parfum (Fragrance), Aloe Barbadensis (Aloe Vera) leaf juice, Sodium Acrylate/Sodium Acryloyldimethyl Taurate Copolymer, Poluglyceryl-6 Behenate, Xanthan Gum, Mica, Citric Acid, Ethylhexylglycerin, Euterpe Oleracea (Acai) Fruit Oil, Theobroma Grandiflorum (Cupuacu) Seed Butter, Paulinia Cupana (Guarana) Seed Extract, Phenoxyethanol, Sodium Benzoate, Potassium Sorbate, CI77491, CI77891.